est basé sur 3 sources médiévales principales : le plan de Saint Gall, le capitulaire de Villis et les textes d’Hildegarde de Bingen. - le « verger-cimetière » où l’on trouve gisants et arbres fruitiers. The medieval garden of Tusson suggests what could be a monastic garden between the 13th and 14th century. At this time when the Catholic religion is omnipresent, the garden is an attempt to represent the lost paradise, each element of the composition is symbolic. 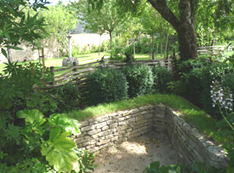 The garden is based on 3 main medieval sources: the plan of St. Gall, the capitulary of Villis and texts of Hildegarde of Bingen. These sources have divided this garden into 3 parts: the «garden of simples» dedicated to medicinal plants, the «garden of scents» composed of ornamental plants and the «orchardgraveyard » where we find recumbent and fruit trees. De mai à octobre du mardi au dimanche de 10h à 12h et de 14h à 18h. Du 01/06 au 30/09, de 10h à 12h et de 14h à 19h. Tarif 3 € par adulte (Gratuit jusqu’à 13 ans) - possibilité de billet jumelé avec le musée de la vie rurale.